My Place: A Sulky Girl and more postcards. This girl was drawn from an old cutting I had stashed away; I had been meaning to draw her for ages. I don’t know where the photo came from as it was many years ago I should really put the source on the back, but when I am ripping bits out from magazines, I get too lazy to do so thinking I will remember. 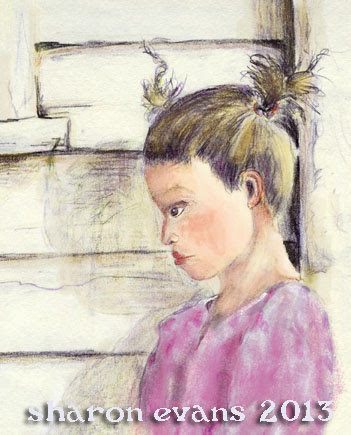 This picture called to me as it reminded me of myself as a child, I use to hide at the back of the house and sulk! Never for too long. I was a very inquisitive child, and would find something to take my mind off the imagined or real insult. I used coloured pencils and chalk pastels. My give away starts this week. If you leave a comment during the month of July I will put you in the weekly draw to win two postcards. The winner can choose from the postcards on my postcard page, (tab at top). I decided to do this as everyone has different tastes. Also, as it a celebration of 1 year of blogging and during that year I have gone along many paths, I felt it would be good to have a representation of my different styles. I will be adding to it as the month goes on. The two I am adding today are watercolours. I am also giving away 2 cards on my Paint Party Friday Posts, so you can comment there and get two chances to win every week. Have a happy Sunday Sketches and a good week everyone and blessings. 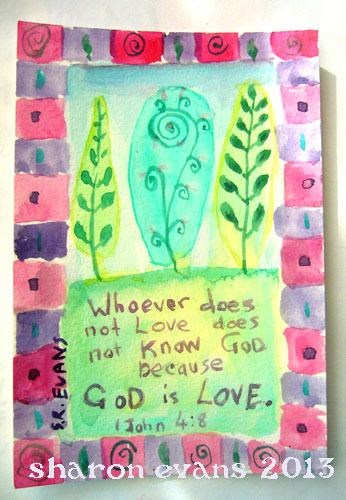 Alexandra’s Sunday Sketches at Blue Chair Diary Illustrations. Thanks so much for dropping by my place. I love your "sulky" girl--yes, I know all about sulking. I could sulk with the best of them. But I, like you, never remember it lasting very long. She is wonderful Sharon love all your new works! Ha, yes i too was a sulker-my dad took a great photo of me mid sulk stomping around my bedroom once-petted lip and all! Great portrait of your sulky girl and very generous of you to do the give away. nice work today Sharon, she does look sulky! Pretty watercolours too. Beautiful paintings! Love the colors! 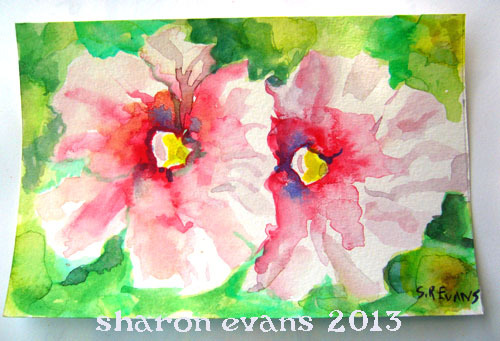 Very pretty watercolours, I especially love the flowers! And I think everyone can relate to the sulky pouting of the girl in your picture - you got her expression great!